Easter is quickly upon us, and now is the time to start planning what you’re going to do for your children’s Easter baskets. Children love waking up to all of the goodies in their baskets while parents love watching their happiness and excitement. This year, we encourage you to take a little more time planning your children’s Easter basket to make sure they include healthy treats. As a 07090 family dentist in Westfield, we want to see your children stay healthy. While it may only be for just one day, even one day of unhealthy treats can send the wrong message to your child. Not to mention, it can impact your child’s oral health. We all know that sugary treats can eventually lead to an unhealthy body, but did you know unhealthy treats can lead to an unhealthy mouth? Our mouths have a certain amount of bacteria present at all times, which is why regular brushing and flossing is needed to remove the bacteria. However, even with proper oral hygiene, the bacteria remain in the mouth. When you eat sugary foods, the sugar is naturally attracted to the bacteria, causing it to turn into acid. This acid eats away at the enamel. Since children often don’t brush or floss well, there is an extra accumulation of bacteria in between dental visits. When they eat sugary foods, the bacteria will turn to acid, sitting in hard to reach places until their next dental cleaning. These areas, such as in between teeth and the deep crevasses of the molars, are already prone to cavities. Combining the effects of sugary foods and poor oral hygiene habits, you’re opening the door to tooth decay when including unhealthy treats in Easter baskets. With a little creativity, you can make the treats yummy and fun. For example, homemade cookies are much healthier and have less of an impact on teeth than candy. Make yummy cookies cut out in the shape of carrots or rabbits. Or, find decorative Easter bags to put the treats in for some Easter fun. 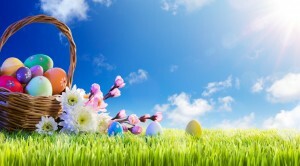 At Westfield general dentistry, we believe in enhancing the health and beauty of smiles, which is why we want you to make healthy choices for your children this Easter. You’ll not only protect their teeth, but teach them an important lesson about making healthy food choices and protecting their oral health. If you’re in need of a great family dentist in Westfield, choose a dentist who truly cares about your family. Call us today at (908) 543-7629 to learn more about our services.